1. 2 in 1 Tube Bender Tool for Pipe Bending. 2. Designed to smoothly bend copper, brass, aluminum, and other thin walled steel tubing without crimping. 3. Two channel design for work on 3/8-inch (10mm) and 1/2-inch (12mm) O.D. tubing. 4. Marked degrees Gauge accurate angles from 0-180 degrees. 5. 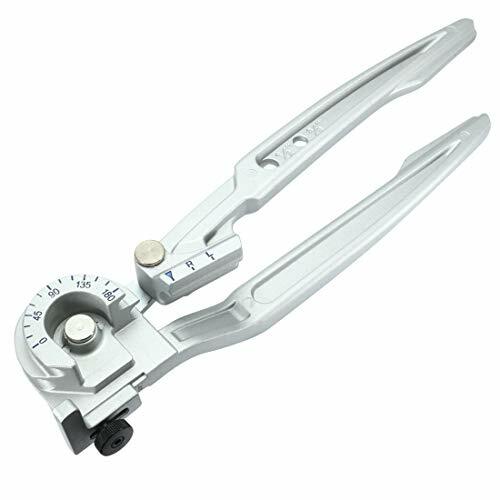 Angles and bends etch marked on tool to provide simple and clear identification for easy use. 6. Ideal for several water, gas, refrigeration, and brake line applications. 7. Opens up fully to allow you to put on the pipe even when the pipe is partly installed. Hetai Heavy Duty Wire Cutters Steel Cable Cutter Wire Rope Cutter Aircraft Bicycle Cable Cutter,Up To 5/32"